Join us for a moving and informative presentation! DUX Humanity in Action is a partnership of the Duxbury Senior Center, The Duxbury Interfaith Council and Duxbury High School. 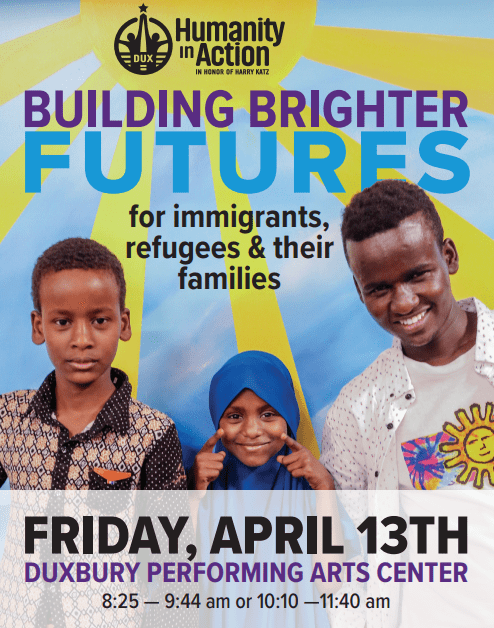 2018 Goal: To raise funds for the International Institute of New England, to help refugees and immigrants realize their dreams and contribute to New England’s growth and prosperity. How to Help: Give to support education in English language training and job skills training to provide a pathway to self-sufficiency. DHS Humanity in Action Ambassadors: Katie Coakley, Luke Maggio, Julie Phipps, Friend Weiler and Jessica Weiners.